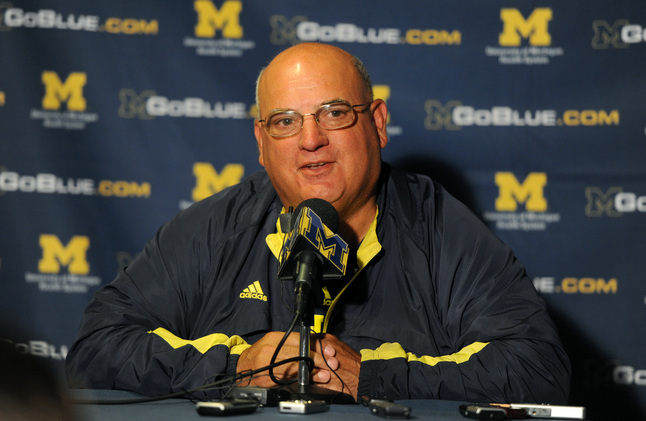 Posted on Wed, Aug 8, 2012 : 12:50 p.m.
Michigan offensive coordinator Al Borges says sophomore Thomas Rawls is the leader to replace suspended Fitz Toussaint, if a replacement is needed. The Michigan football team spent the duration of last year's fall camp searching for a lead tailback, and found its guy in Fitz Toussaint. But when Toussaint was indefinitely suspended last month after a drunken-driving arrest, the Wolverines were thought to be doubling back in this year's camp. Turns out, that competition is essentially over before it started. Michigan offensive coordinator Al Borges said Wednesday that sophomore Thomas Rawls likely will get the call if Toussaint is unavailable for the season opener Sept. 1 against Alabama. Senior Vincent Smith was the primary backup last year. "We're just going to the next guy -- we're not really changing anything," Borges said during a news conference at Schembechler Hall. "Thomas Rawls is going to be that next guy. Vince is going to do what he's done, and on we go. "The key to these situations from a game-plan perspective is try to make it as seamless as you can. Just go." Borges said Rawls could even challenge Toussaint -- who eclipsed the 1,000-yard barrier last year in his first season as the starter -- when he is eligible to return. "Thomas is going to get a good chance, and Fitz is going to get a good chance," Borges said. "Justice Hayes is in the fold too." Rawls has only 13 career carries, 10 of which came against Minnesota last year, but his physical running style gave him a slight edge over the more-seasoned Smith. Borges said he'll know more after the team begins hitting in full pads later this week, but for now, Rawls is the guy who will get the call against the Crimson Tide -- last year's No. 1 rush defense. “He’s reckless -- he runs with a demeanor that’s aggressive," Borges said. "He looks like he’s mad when he runs. He’s a tough guy. When you hit him, you’re going to feel him, I promise you that. Smith, a senior, will retain the role he had last year, when he played primarily on third downs. He's excellent in pass protection, and also highly effective as a target in the passing game. "Vince is going to pretty much play the same role as a year ago, and that wasn't always on third down," Borges said. "He was in there sometimes to spell backs. We'll just see how it shakes out." Thu, Aug 9, 2012 : 4:46 p.m. Different circumsatnces but I remember during the 2000 Season when Matt Guiterez was hurt and was replaced with John Navarre. Hopefully he'll be up to the task. Fri, Aug 10, 2012 : 2:04 a.m. It was Drew Henson who was injured and replaced by John Navarre for the first few games of the 2000 season. Matt Guttierez was injured and replaced by Chad Henne in the 2004 season. Thu, Aug 9, 2012 : 1:13 p.m. It would be a proud day if we had a all Flint running game at halfback. Hayes and Rawls are 2 very tough guys. Don't sell either of them short! Go Blue! Thu, Aug 9, 2012 : 6:52 a.m.
Thu, Aug 9, 2012 : 5:12 p.m.
Thu, Aug 9, 2012 : 3:42 p.m. Going to a game in Death Valley is a dream of mine. It's one of the sports experiences I'd love to have. Like going for a game at Wrigley or a race at Daytona. Maybe one day! As for the cold thing. I distinctly remember sitting in the freezing rain (2007) watching yet another beat-down by OSU at Michigan Stadium. It's not that way all the time but it happens. Even more than the weather it's the thought of the Gator's or Trojan's crossing town while the B1G travels across country. Somewhat an excuse, somewhat reality. Thu, Aug 9, 2012 : 2:57 p.m.
@Blue. i can't argue with your being 'old school&quot;. I commend it. can dispute the playing in cold thing though :-) um and big 10 have never regularly played in the cold. Any cold or snowy games actually played (and not very often) were purely an anomaly. you end your season in November and have always played your bowl game (rose) in sunny and warm CA. and when ya'll finally decided to play a &quot;championship&quot; game, you chose to do so indoors. Now, if you wanna talk about playing in some extreme weather...why don't ya'll come on down to Baton Rouge in September and play some ball? Thu, Aug 9, 2012 : 2:26 p.m. When Bo gives his famous The Team speach the championship he's talking about is the Big Ten Championship. I know times have changed but I'm old school and that's the most important part of the season to me. That and beating OSU. Michigan has certainly struggled in their bowl games over the years (although 11-9 over the last couple of decades) but I'm going to stick with the same old B1G excuse. Let's start playing the Rose or Outback Bowls in Soldier Field in early January and see how those results change. Go Blue now and always! Thu, Aug 9, 2012 : 1:29 p.m.
Thu, Aug 9, 2012 : 12:42 p.m. I can't add much to that Larry. Yes, there are those that don't like Mich as opposing fans and I can respect that however, it's becoming more apparent that there are some folks coming on the site just enjoying stirring up good Mich. fans. I'm starting to believe that those few folks have no interest one way or another in Mich. or for that matter any other college team. Some may ask what's in it for those folks and I think the sport of it is just aggravating others especially dedicated fans like you and me. Thu, Aug 9, 2012 : 6:02 a.m.
Rawls looks good but if he gets hurt- with his hard running style- the pressure will be on to put Fitz the cat back on the field. Smith is great on the screens and for blocking but he is too small for short yardage situations. Fri, Aug 10, 2012 : 4:45 a.m.
Denard has been our best 3rd and short back by far. He's not very big, either. What does size have to do with short yardage efficiency? Thu, Aug 9, 2012 : 5:27 a.m. Wed, Aug 8, 2012 : 9:28 p.m.
Ted would have us believe that Mich. is always going to be mediocre at best on offense. Well Ted I say to you, you might be on to something but then again Ted, you could very well be dead wrong and if we're grading your lack of optimism based on last years example of our offense I would say your dead wrong Ted. Mich. is going to return to glory years with this coaching staff in my opinion. I hear more folks talking about Brady and staff than I ever did Gary, Lloyd or RR out here in Calif. I say 2-3 more years to get their type of players on board and to develop the type of depth Mich. will need to consistantly dominate the BTN. Thu, Aug 9, 2012 : 1:17 p.m.
@Hail...understandable ya'll out there on the West Coast didn't know anything about Brady...he had a 0.52 record at San Diego. but your dead on with the stuff about the AD. he really has done a great job and people really are hoping um is heading in the right direction. Thu, Aug 9, 2012 : 1:11 p.m. Although not in 100% agreement with Ted, I mostly agree (sorry Ted...you'll get a lot of flack for having me on your side). The days of arbitrary Polls deciding who is the best i college football are gone. and have been so for 14 years now. Going forward, the Polls are going to be even more diminished as we go to a playoff system. Winning your Conference will not necessarily get you into the national conversation! If a conference is seen as weak, being it's champ won't make a difference and will not get you into the playoffs. Also, striving to be the best in the big 10 isn't really that much of a &quot;stretch goal&quot;. Historically, the big 10 champion has done extremely poorly in their bowl games. During the BCS era, the big 10 champ has only won 36% of their games. During the past 40 years, the big 10 champ has only won 35% of it's games. (win/loss was for the team that went to the Rose Bowl or National Championship game). So being a big 10 champ...well...who cares. Thu, Aug 9, 2012 : 12:34 p.m.
Thu, Aug 9, 2012 : 4:11 a.m.
To be fair, Gary, Lloyd and RR didn't coach in Cali before they came to Michigan. That might have something to do with people talking out there. Wed, Aug 8, 2012 : 11:52 p.m.
Is it ? Alabama didn't even win their division this year. But that is besides the point. #1 There have been no glory years. #2 By setting and the stated goal so low there comes satisfaction with small conquests and any real accomplishments are never realized. It's time to talk about winning the big, real prize and that is to be the best team in the country. You only do that by winning the most relevant accomplishment. The National Championship. Talk about that ! Wed, Aug 8, 2012 : 11:38 p.m.
Ted, as you should know, all great teams must think about winning their conferences 1st before they can give a, National Championship a thought, it's common sense Ted. Wed, Aug 8, 2012 : 10:43 p.m. Dominate the Big Ten ? Wow, you set the bar low ! Glory years ? Wow, you set the bar low ! How about winning a National Championship !? Wed, Aug 8, 2012 : 9:45 p.m. Agreed Hail.. something tells me Ted is green with envy ,like a sparty right Ted.. Wed, Aug 8, 2012 : 7:31 p.m. Wed, Aug 8, 2012 : 7:14 p.m. If Fitz can't go, mix it up with both Rawls and Smith. You'll need VS's experience out there against Bama. Bama's D will have no problem with Rawls not wanting to avoid them, they may just invite it...remember, they use to practice against Richardson. Or, another thought is, put them both in at the same time. Rawls at RB and Smith at WB, that could help with the blitz. Wed, Aug 8, 2012 : 7:13 p.m. It's too bad his redshirt got burned last year for 13 carries. Looking forward to seeing what he can do as a sophomore. Hail! Thu, Aug 9, 2012 : 6:03 a.m. Wed, Aug 8, 2012 : 6:10 p.m. I think it's great they made decision so fast. This way all the backs know and the team can practice as a complete unit and not split practice time between backs. With only 3 weeks to prepare, the starters need to gel quickly and focus on Alabama, not worry about who is going to start. Thu, Aug 9, 2012 : 12:33 p.m.
@Mil. I would agree with you if a &quot;decision&quot; had been truly made. but to caveat a &quot;decision&quot; by saying &quot;no decision has been made about Fitz starting&quot; isn't really a decision. Wed, Aug 8, 2012 : 9:32 p.m.
Ted, I made no mention of my opinion on how well Rawls will play. My point was only that I'm happy they made a clear decision and that they can focus the training with a set 1st squad and not have to split practice time. This way Rawls (no matter how good or bad he will play against Alabama) can have all the practice snaps and be fully prepared to handle the duty. Wed, Aug 8, 2012 : 9:25 p.m. They couldn't do anything vs Virginia Tech with our genius Borges at the helm. Do you think Alabama is going to be easier (even if they have to replace half the starters). Just being realistic. Wed, Aug 8, 2012 : 9:22 p.m. I will bet my life on it that Rawls doesn't gain over 10 yards vs Alabama if they run the I-formation even half the time. Wed, Aug 8, 2012 : 7:10 p.m.
Milqueman, I was surprised a bit to hear Borges make such a firm declaration on this battle so early in camp. I expected it to last at least a couple weeks, especially out of respect for a senior (Smith) who has paid his dues. They must really like Rawls, really want to decrease distractions that are inherent to job battles, or both. I'm betting it's the latter. Wed, Aug 8, 2012 : 5:42 p.m.
Also helps when you have Denard back there, who is a 2 time 1000 yard runner. And let's not forget the fullback. Thanks for the articles ongoing. Thu, Aug 9, 2012 : 4:32 p.m. Wed, Aug 8, 2012 : 9:19 p.m.
Really ? Borges handicaps Denard when he puts him under center. He is absolutely no threat at all in that formation and all of last year proves that. Wed, Aug 8, 2012 : 7:32 p.m.
Good point about Fitz helping Denard too--you are absolutely right. But he did what he did and now should pay (in my opinion) regardless if it hurts the football team. Thank goodness he didn't get into an accident and maim somebody or worse. Looking forward to the story on Hopkins. I think back to effective fullbacks in the last few decades, and Jarrod Bunch comes to mind--he was a beast *but couldn't always hold the ball. Leroy Hoard was a TB/FB and was also great. Chris Floyd, Aaron Shea who once took out two Wisconsin defenders with a single block. It's such an important position and helps to create a lot, especially if they can carry the ball or catch it. Wed, Aug 8, 2012 : 7:23 p.m.
heartbreak, absolutely Denard helps. Dude's electric. I would add, though, that Toussaint also helps Denard. The two were highly effective last year, which helped to split the defenses' attention. If Toussaint misses time (and I think that's the case), teams can focus even more than they already do on Denard. As for fullback, I'll have a story in the next day or two on Stephen Hopkins. It's kind of an overlooked position in such a crowded backfield, but he's dynamite at that spot. Not many fullbacks can catch the ball like he can out of the backfield. Gives Michigan an added dimension. Wed, Aug 8, 2012 : 5:40 p.m. It should be Justice Hayes. He is quicker, faster, more elusive and more athletic than Rawls. Wed, Aug 8, 2012 : 11:19 p.m. Wishful thinking ted. Rawls will eat your team up and you know it. Wed, Aug 8, 2012 : 9:50 p.m.
ted, there's a guy who plays at Wisconsin. His name is Montee Ball. He's all about power, with a bit of speed mixed in...and rushed for 1,923 yards last year and accounted for 39 TDs. That matches Barry Sanders' single-season record. My point is, there are lots of different types of backs who can be successful. I have no idea if Rawls is one of them or not -- but just because he runs with power, and Hayes with speed, doesn't mean Hayes is better. In fact, judging from coaches, I'm guessing Rawls is better right now, and now just by a little bit. I mean, the Wolverines will play the nation's reigning No. 1 rush defense -- if Hayes were better than Rawls, you can bet the house he'd be in there instead of Rawls. And that won't be the case. Wed, Aug 8, 2012 : 9:12 p.m.
Would you call the 1st option ( Tousaint ) a power back ? He is #1 because of his athleticism. If you want people to turn the channel in favor of watching an exciting offense you should be happy with where Michigan is taking their offense. Boring and predictable. It's a safe offense and it will beat the teams less talented, but when it comes to the great teams it fails miserably. But, it's safe offense that will allow for Borges to keep his job and he knows it. I can already hear the buzz from the small planes flying over Michigan Stadium as the crowd returns to the most quiet and uninterested in all of college football. Wed, Aug 8, 2012 : 8:59 p.m.
Hayes' Athletisism is far more potentially benificial than Rawls physicality. We will see what happens when Rawls runs right at someone who knows ho to tackle. A running back needs to be elusive. Its not hard for a good team to stop a running back that relies on power. Wed, Aug 8, 2012 : 8:54 p.m.
Hayes did take a couple of snaps in the spring game and his high school tape shows me that. It shows he is the better option because he is a far superior athlete than Rawls. ; I'd rather have someone who can get me 50 yards than someone who gets 3.
ted, what makes you think Hayes is a better option than Rawls? We haven't seen the guy take a single snap yet. What I know: Rawls has been ahead of Hayes since the day they stepped foot on campus, evidenced by Rawls playing last year and Hayes redshirting. And now, Borges, in his first presser of the fall, names Rawls as the starter if Fitz can't go, in no uncertain terms. It's pretty clear the hierarchy. To me, it doesn't even seem close between the two, which means Rawls' physicality is better suited for Michigan (right now) than Hayes' athleticism. Wed, Aug 8, 2012 : 6:27 p.m.
Not sure the is the philosophy of our coaching staff going forward; especially since you already have someone like that (Denard) in the backfield. You need someone who can get you a guaranteed 3 yards. Wed, Aug 8, 2012 : 5:14 p.m.
&quot;There are times when he's simply not interested in avoiding you.&quot; I can't wait to see Rawls in action! Even if Fitz never got in trouble and was able to practice, I am sure there would be a lot of competition for the feature tailback spot with Thomas Rawls. The entire tailback roster looks stout to me. Am impressed with the overall depth. Wed, Aug 8, 2012 : 7:06 p.m.
MRunner, I think coaches are pretty pleased with Toussaint on the field (off the field, of course, is another deal). I doubt there would have been, or will be, real competition for the featured spot. ... But I do think coaches are real high on both those guys, as well as Smith. That's a solid grouping. I disagree they are good talent wise, but not great.